It’s been a hard winter to be a fat biker in Crested Butte, and it’s been a great winter to be a fat biker in Crested Butte. Fat biking on singletrack at Hartman’s?! Snow-shoe packed technical trails?? Amaze-balls! We love it! And . . . 6 weeks of snow recently has set us back. But we’re digging ourselves out up here and getting back trails for YOU to ride, little by little. Last week, we dug out the snowmobile and the grooming mat, and we groomed the trails at North Village and Teddy’s so you could get some fat bike loops in on Snodgrass. 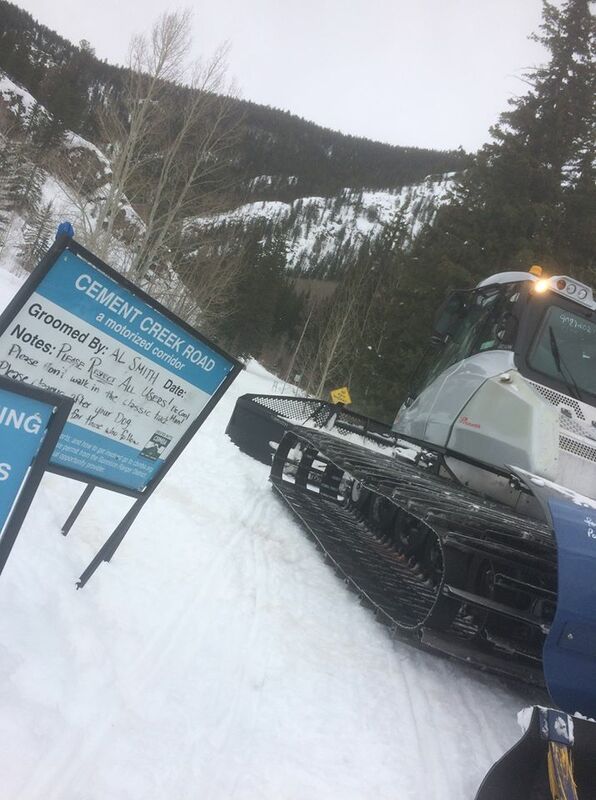 This week, with the help of our friends Al Smith, Brian Alsum, and Sno Trackers, we were able to get a bona fide snow cat out Cement Creek to cut the road back in all the way to Deadman’s. HUGE THANK YOU to these folks for helping us keep trails open year-round! We also heard from you, The People, that Kebler is riding great! Avid fat biker and loyal CBMBA-ite Robbie was up there twice in the last few days, and said he was able to put together a great loop out to Ohio, up to Lily Lake, and back down Splain’s Gulch. His tip: ride early so you don’t have to deal with as much wind on Kebler. Another huge THANK YOU to Sno Trackers for keeping Kebler Pass Road groomed open for all users. With snow in the forecast for today and Sunday, keep an eye on the CBMBA Fat Biking Trail Report. We’ll let you know how it looks out there. As always, send us your Observations. And please, before you head into the backcountry, check the CBAC Avalanche Report for current conditions. Make safe choices, folks!